How does Nutramax Denamarin Chewable Tablets 60ct (2 x 30ct) work? When liver function is compromised, the exact cause can often be difficult to determine. Supporting the liver, regardless of the cause, is essential to keep it working properly. Administering SAMe (S-Adenosylmethionine), which is found in Denamarin, has been shown to markedly increase liver levels of glutathione,1,2 an important compound for liver health formed when SAMe is metabolized. The SAMe in Denamarin has also been shown to help protect liver cells from cell death and may help cell repair and regeneration. Denamarin also helps support your pet's liver through the administration of silybin. Silybin is an active part of an extract from milk thistle, known as silymarin, and has been shown to support liver function by helping maintain a healthy oxidative balance. While best known for supporting the liver in dogs and cats Denamarin also has a place in supporting brain health. Research is looking into dog aging and associated decreases in levels of S-Adenosylmethionine (SAMe) in cerebrospinal fluid, which surrounds the brain. Denamarin provides SAMe in a stabilized form to help with brain health and act as a neuroprotector. Denamarin also provides a bioavailable form of silybin which supports oxidative balance. 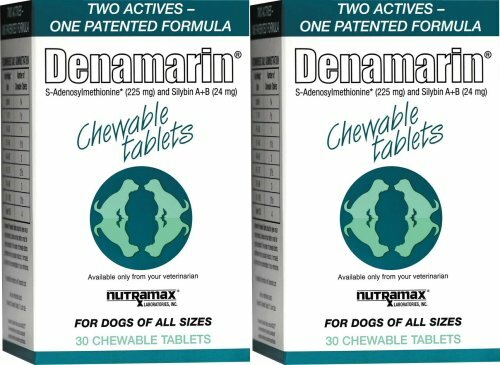 The new chewable tablets of Denamarin allow dogs to receive SAMe and silybin in a tasty treat, eliminating the need to "pill" your dog daily. Additionally, the chewable tablets allow for quicker uptake of the SAMe and less variability between dogs when compared to enteric-coated tablets. Advanced technology in the exclusive NMXSS75 S-Adenosylmethionine found in the chewable formulations provides stability eliminating the need for enteric coating or foil-on-foil blistering. The chewable tablets for dogs are tasty, single size and scored for easy administration.